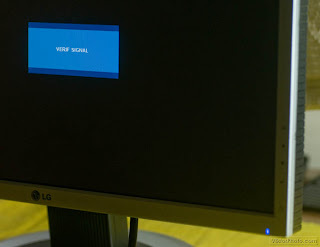 Some time ago I was donated a non-working LG L194WT-SF LCD monitor for parts. After a couple of months of collecting dust with it I decided to have a look at it from the inside. Since the monitor has been at a repair shop and was declared beyond repair, I thought I had nothing to lose- best case scenario, I fix the monitor and can use it or give it away in the future, the worst case scenario, I see what components are inside in such a piece of hardware and I might be able to salvage some parts for my projects. There was only one problem with this monitor: it didn’t respond to switching on. Absolutely nothing happened when the power chord is plugged in and the power button is pressed. Most LCD monitors fail at either the backlight module (inverter) and at the power supply. When the inverter or the backlight is broken the monitor is still fully functional, just the picture is very difficult to see. Since this monitor was completely dead (well, pretended, anyway J) I suspected that its built-in switch mode power supply was at fault. In switch mode power supplies, most often, one (or more) of the capacitors usually give up due to thermal wear-and-tear. 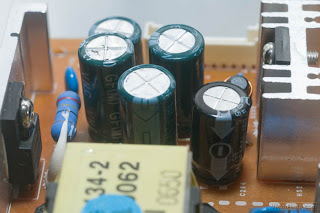 Since this monitor is quite a few years old, these capacitors were my primary suspects. The monitor’s enclosure is held together by only 4 big screws on the back. After removing them, and gently prying the front frame off, the whole enclosure comes off easily. Only remains the LCD panel and a big box of electronics. 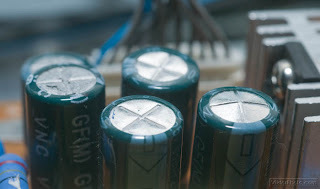 To flip the big box of electronics some connectors must be unplugged from it, they are the power supply for the background light of the LCD panel. Once the cables are free the big box of electronics folds out freely, providing easy access to the component side of the PCBs in it. Switch mode power supply. 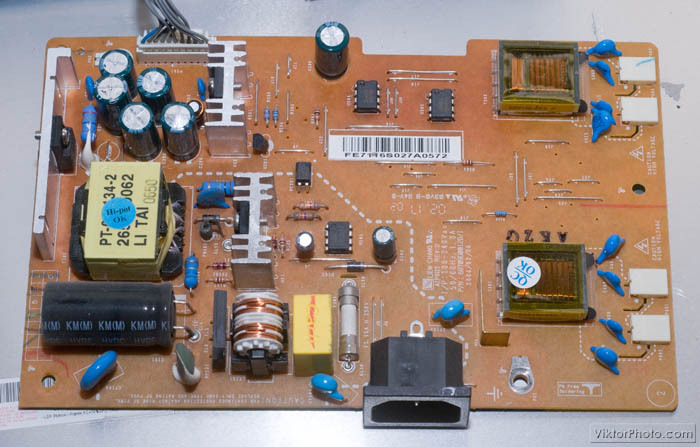 Notice the standard AC inlet at the bottom and a cluster of similar capacitors in the top left corner. There are two printed circuit boards in it, one is the power supply and the other is the display driver. 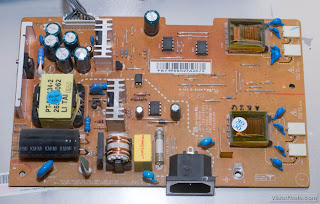 I didn’t have to poke around long – once I saw the components on the power supply board I immediately noticed that one of four capacitors in a bunch had deformed – a clear sign of a faulty capacitor. Just what I expected! Here the problem is clearly visible: BUSTED! This is the bad boy after desoldering it: even the bottom of it is out of place. The culprit is 1000uF/16V. 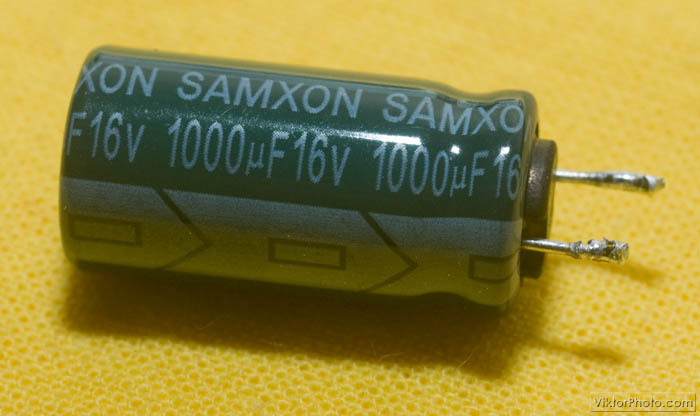 I had a look at my pile of junk and I quickly found a similar one, 1000uF capacitor, rated at 25V that I had salvaged from a broken motherboard. It was even smaller in size. Anyway, the soldering job was easy. When I soldered in the new capacitor I immediately tried if this fixed the problem – maybe other parts had to be replaced as well. Luckily enough, the monitor powered up straight away – success!!! Power LED on + "something" on the screen = success! Although this fix was done on a particular LCD monitor, other monitors, even very expensive TVs with similar problems could be fixed like this. It's very little effort and it's very economical. You should check that repair shop's dumpster every week. Dunno what the "repair shop" was expecting, monitor repairs don't get much easier. Samxon GF series are "replace on sight" in switchmode applications. If you didn't replace them all, you'll be going back in later. Very well put! :) I didn't know about this "rule" so I didn't replace all of them. Next time I will!!! From my experiences with repair shops, most of the people think like a technician, "Oh, the problem is on this board, better order a new one." This is what I was taught in all of my electronics classes. Not many people think "What made this board go bad?" which is puzzling to me. I like to figure things out on the component level much like you did. all it takes is a little time and experience to make a cheap fix. I am impressed with your website and it's content, keep up the good work! Yes, the mind boggles... :) Thanks! Perhaps not surprising that the cap closest to the heat sink has popped.